Due to the increased difficulty in the development and maintenance of pavement with limited financial resources, Unavailability of high quality materials and Geogrid gained increasing acceptance in road construction. Various process involved in Geosynthetics commercial construction aid are Separation, Reinforcement, Filtration, Drainage and Containment. 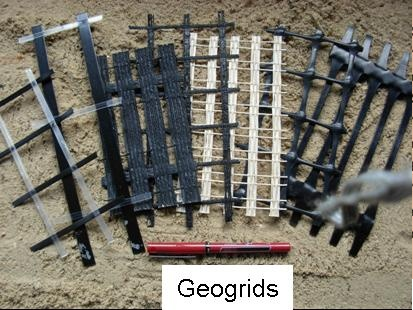 Geogrids are made from polymers. Openings between adjacent longitudinal and transverse ribs called apertures. Formed by regular network of integrally connected elements with apertures. Longitudinal and transverse ribs meet at junctions (nodes). Both rib strength and junction strength are important. Different type of Geogrids are Woven Geogrids, Geogrid Composites, Extruded Geogrids and Welded Geogrids. Extruded Geogrids - Extruded geogrids are formed using a polymer sheet that is punched and drawn in either one or two directions for improvement of engineering properties. Different functions are Separation (Secondary function) and Reinforcement (Primary function) which Improves engineering properties of pavement system . It uses Construction aid over soft subgrades, Improve service life and Reduce structural cross-section for given service life. Different applications of Extruded Geogrids are Mechanical subgrade stabilization, Aggregate base reinforcement and Asphalt Concrete (AC) overlay reinforcement. Different reinforcement mechanisms are lateral restraint, improved bearing capacity and tensioned membrane effect. Different Geogrid Reinforcement Mechanisms are Lateral Restraint, Improved Bearing Capacity and Tensioned Membrane Effect. Determination of the Subgrade Shear Strength(C) - Directly measured using vane shear devices and Converting from CBR to Shear Strength. Determination of Design Traffic - Based upon the gear configuration of heaviest vehicle expected in the traffic mix (Single-wheel Load, Dual-wheel Load and Tandem-wheel Load). The combined weight on the selected gear is used as the design vehicle weight. Determination of the Reinforced Bearing Capacity Factor (Nc) - The Unreinforced Bearing Capacity Factor = 2.8 . The Reinforced Bearing Capacity Factor Recommendations,CBR VALUE,GEOTEXTILE, GEOGRID and both. For Geogrid installation Site should be cleaned. Geogrid should be rolled out by hand directly on subgrade/geotextile for design aggregate thickness < 14 in. For thickness > 14 in. it should be placed in the middle of aggregate layer. It can be held in places using staples, pins or sand bags for windy conditions.